At a national Primary Mathematics Challenge event held at Cranford House School last month, Liam Sadler, currently a Year 5 pupil at Charlton Primary School, achieved the Bronze award by scoring 16 points (at the higher end of Bronze level). This a wonderful achievement by Liam, who showed his considerable maths skills across a range of mathematical challenges. Following the initial round, Liam was invited to take part in a Bonus Round which is where he achieved his remarkable result. Ofsted praised Larkmead School’s ‘caring ethos’, citing it as a ‘stimulating place’ where pupils’ confidence can ‘blossom’. The school received a glowing report after Inspectors visited the school in January and subsequently re-awarded the academy’s previous rating of ‘Good’. This was the first inspection since Larkmead converted to an academy within the Vale Academy Trust in 2017. In their letter to Chris Harris, Headteacher, they noted: “Your approach to leadership is characterised by your principled and determined pursuit of high standards in all areas of school life. Morale is high and everyone shares your determination to provide the best for each pupil”. Larkmead currently has 740 pupils, described in the report as “well-behaved, kind and respectful”. The report recognised the dedicated team of staff who worked with “determination and sensitivity” to ensure more vulnerable learners were supported. Following publication of the report, Chris Harris commented: “We are delighted to maintain our ‘Good’ rating and that the report strongly reflects the progress being made. We had exceptionally strong support from parents, students and staff”. In a letter to parents, Mr Harris added: “We have a fantastic opportunity to push our school forward and to build on this strong position. There should be no limit to our ambition”. The 98 students and 12 staff on the inaugural joint ski trip to Risoul, France have arrived safe and sound at the ski resort, and everyone is settling in well. The first day of skiing was excellent and weather was perfect. Everyone is already making progress. Weather is good again today for another day of great skiing. On Monday, 7th January several sixth-form students from King Alfred’s Academy, the Downs and St Helen and St Katherine’s Schools attended an A Level Study Day on 18th Century studies organised by the Vale and Downland Museum of Wantage, in collaboration with the Universities of York and Leeds, the White Rose College of Arts and Humanities, and with funding from the Arts and Humanities Research Council. The day was also attended by research students and lecturers from Oxford Brookes University. The keynote speech was given by Dr Joanna de Groot, Senior Lecturer at the University of York, who wove a fascinating interconnecting web of global history across the 18th Century, arguing that it is not possible to make sense of European history without considering its global aspects, and illustrating her talk with dozens of anecdotes and potted individual histories that supported this argument. She finished her talk by urging the students to consider viewing the world from different global perspectives and so decentre European history. With heads buzzing with new ideas, the students then rotated their way through three main seminars, each run by different pairs of Academic Researchers from the two participating universities. One seminar, on medical humanities, considered the rise of the “man-midwife” and its cultural and political ramifications (led by Rebecca Simpson, York); and evaluated the role of children’s sleep in the 18th Century (led by Frances Long, York). Another seminar explored 18th Century literature, discussing the use of diaries and other life-writing works in the study of history (led by Holly Day, York); and the evolution of the epistolary novel (led by Helena Senior, York) with a focus on gothic novels. The third seminar questioned the ethical and cultural impact, both at home and abroad, of the practice for young gentlemen to go on a “Grand Tour” of Europe before settling down to their responsibilities (led by Lilian Tabois, York); followed by a discussion of the “Etruscan” style and Neoclassical Design, and how these patterns became incorporated into 18th Century Design (led by Hannah Kaspar, Leeds). Hosted at the museum, the day was well supplemented with teas, coffees and delicious cakes, as well as a generous buffet lunch that allowed the students time for informal chats with the academics, as well as to engage in some academic networking. The board of Vale Academy Trust is delighted to announce the appointment of Richard Evans as Chief Executive in succession to Simon Spiers who will retire in April 2019. Richard is currently Director of Education at GLF Schools Trust, a multi academy trust with 7 secondary and 23 primary schools across the south of England and he is also the Chief Executive of the Oaks Multi Academy Trust based in Surrey. Joe Pillman, Chair of Vale Academy Trust, said “We are delighted to have been able to recruit someone of Richard’s calibre to succeed Simon in delivering the Trust’s vision of securing an outstanding education for children across the Trust’s schools based in South Oxfordshire. Richard brings a wealth of experience and enthusiasm and we look forward to the next exciting chapter in the Trust’s history with Richard at the helm. We were fortunate to have a very strong field of applicants to choose from and are confident we have attracted a strong new leader for the Trust”. Commenting on his appointment Richard Evans said “I am very much looking forward to working with the staff, students, parents and the local governing body of each school within the Trust to celebrate what is going well and help each school continue to grow and develop. Larkmead School in Abingdon has been awarded the Artsmark Gold Award, in recognition of its provision across a range of creative subjects. The Artsmark is a stamp of creative quality for schools and is accredited by Arts Council England. It is awarded at three levels – silver, gold and platinum – and schools can register to be assessed for the accolade. Announcing news of the award on Twitter last week, Larkmead said it was ‘proud’ of the achievement. Arts Council England sets out assessment criteria that schools must match to gain the gold standard. It requires schools to have an ‘established arts and cultural provision’ providing all young people the chance to perform, see live performances, and create and evaluate artworks in a range of media. Our congratulations to everyone associated with this award. Wantage CE Primary School’s Christingle service held yesterday raised £190.58 for The Children’s Society. The annual event held at Wantage Parish Church was attended by KS2 pupils, their families and staff. The service was conducted by vicar Fr. Orazio. The children made the Christingles themselves in school – everyone brought in an orange from home. 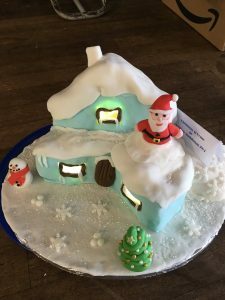 Over previous weeks, the children collected loose change in candle ‘money boxes’ which they brought to the church as a Christmas Offering to donate to The Children’s Society, giving other children a better Christmas through their generosity. Three delightful reindeer at Millbrook School’s Foundation Stage Christmas Nativity production, a cow and a chicken from their Year 1 show, along with Santa and his right hand Elf! 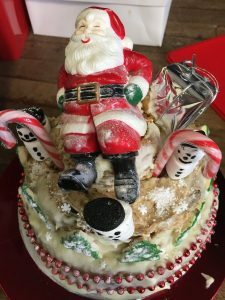 See below for just a sample of the amazing Christmas Cakes made and decorated by KA’s talented KS3 student bakers from a range of fabulous creations – always a difficult decision to choose a winner! 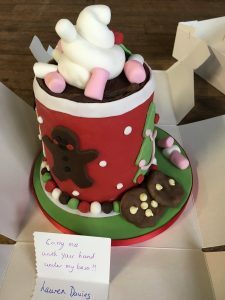 Well done to all the students who entered – and a Happy Christmas to all! 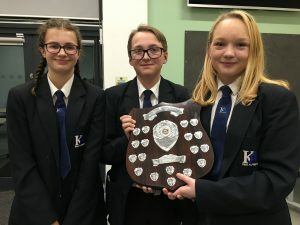 Teams from King Alfred’s Academy competed against teams from Faringdon Community College in the initial local round of the ‘Youthspeaks’ public speaking competition last Thursday, 29 November. King Alfred’s teams won both the Intermediate and Senior trophies. 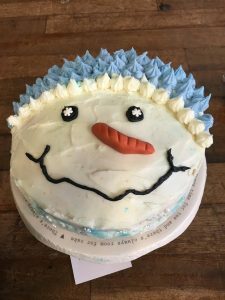 The event, hosted by Faringdon Community College this year and which has been running for over 38 years, was jointly organised by the Faringdon and Wantage Rotary Clubs. King Alfred’s team of Year 9 students clinched the Intermediate Trophy. Catherine Gillott, Joshua Gale and Mimi Partlett gave a very engaging talk on the subject of “The Negative Effects of Stereotypes”. 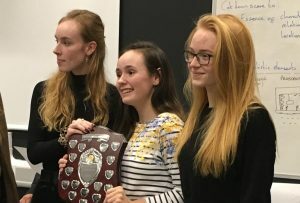 The Sixth Form team that won the Senior Trophy, comprising Jane St. George, Lily Bunting and Charlotte Bell, impressed the judges with their witty observations on “Phobias and the Media”. See below for the full list of students who participated and their talk titles. Subject of Talk: Are Phobias Exploited in the Media?